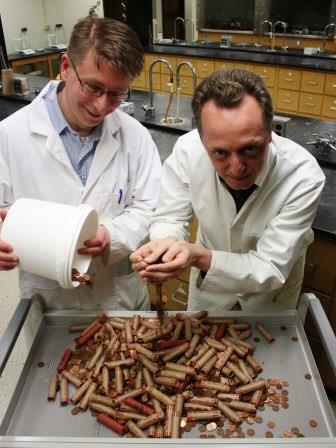 BRANDON, MB – More than 10,000 pennies have been donated to Brandon University (BU) in the past month by residents responding to a public plea by Science professors who use the copper coins in experiments and demonstrations. Each year, BU professors use thousands of pennies in science experiments and demonstrations. School children marvel as the coins are electroplated with zinc then heated, turning from copper to ‘silver’ and finally ‘gold’. But the federal government has stopped production and is phasing out the penny, which prompted the appeal from the Science Faculty. “We will use these coins to kindle a child’s interest in the sciences,” says Dr. Berry. Pennies can still be dropped off at the Dean’s Office in the Brodie Building, Rm 172.